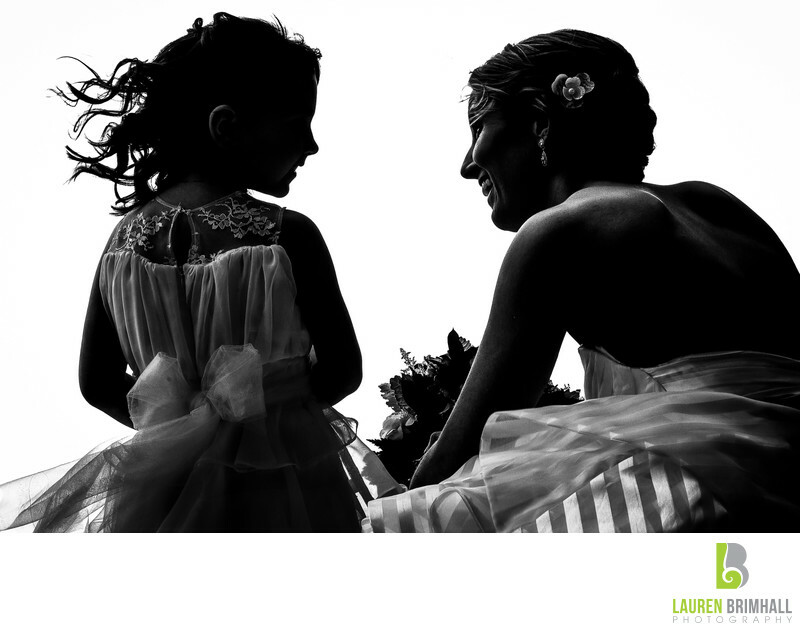 This gorgeous black and white silhouette of a flower girl and bride was taken at a wedding that took place at the Brandywine Manor House Inn in Honey Brook, PA. What makes this image so powerful are the defined lines of the flower girl’s hair blowing backwards in the wind and the bride’s adoring smile as the two of them share a private moment. The contrasting highlights and darks clearly define the details of both the bride’s dress and the flower girl’s, and it’s apparent they are also flowing in the breeze. The delicate lace at the top of the flower girl’s white dress and her tulle bow are perfectly complementary to the lined texture in the brides rouched gown as well. The clean, white background isolates the two main subjects and draw the viewers eye directly to the most interesting parts of this wedding photograph. The silhouette of the bride’s bouquet support this photograph being taken on an actual bride’s wedding day. The composition of the photograph takes your eye to every corner of this totally unique image. The Brandywine Manor House is a popular venue for couple’s looking for an intimate, rustic wedding theme. It comprises multiple buildings, including a barn adorned with Christmas lights and a draped tent with chandeliers and other built-in décor.